“Well bugger the weather, I’m going fishing no matter what” was my answer to this latest spell of heavy snow. Sevenoaks ended up with about 8 inches (and that’s a real 8 inches not just a ‘man’s’ 8 inches, so there girls) which made the roads pretty treacherous. This meant that my planned trip to the upper Thames on Tuesday with my good pal John Kemp had to be cancelled but we hoped to still get out to maybe the Medway. However after snow falling all day Monday and throughout that night, the roads were a nightmare Tuesday morning and we had to surrender to the conditions. Still come Hell or high water I was going Wednesday. Geoff hoped that if things improved, he would also come out to play. 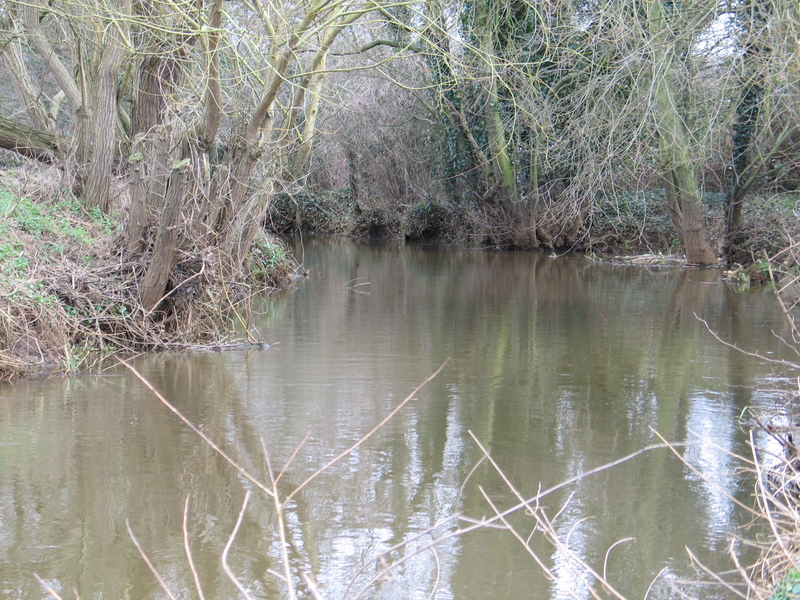 Luckily things did improve and we headed to the small Thames tributary that we have been targeting of late. As usual the river was quite coloured. This seems to be the norm in winter. The water was quite low too and we had found it seemed to fish better with a bit of water on. It looked like there were already a few fishing. Not surprising really as it was the penultimate day of the season. We decided to walk from the very top section down, trying the odd swim if we fancied it. The upper section was fairly shallow and narrow. The whole river is pretty diminutive and very overgrown. It certainly suits a short rod approach. A long rod would be a pain in the proverbials here. Its a fairly urban river too, despite running through several fields. The urban jungle sprawls fairly close by but not close enough to see into any bedroom windows er I mean living rooms! Mind you once you’re tucked away behind the trees you seem a world away from the hustle and bustle of everyday life. There’s just the odd dog walker or horsey types to contend with. The fishing was slow to say the least. After a few exploratory trots through a swim I soon managed a few bites. The end result was several dace and a small roach. I tried a few of the productive spots discovered on previous visits but they only produced the odd fish. Eventually a few slightly better sized roach came my way. Nothing particularly big, perhaps 12-14oz. Still they were beautifully proportioned roach nonetheless. Bars of silver, with those oh so delicate mouths and red fins. The roach perhaps is the perfect fish. Wondrous to behold and the stuff of boyhood dreams (well, amongst other things!). I moved upstream as the afternoon wore on. I was having the sort of day where everything went wrong. I ended up with at least two knots in the main line, which would get stuck in the top eye every trot through. Of course when the knot got stuck in the top eye the pin would continue to spin resulting in a nice birds nest. Then there’s the impossible hook length knot. This forms out of nowhere and is caused by the most imperceptible of flicks. It creates a lovely and unpickable knot in the hook length. Pass the packet please! 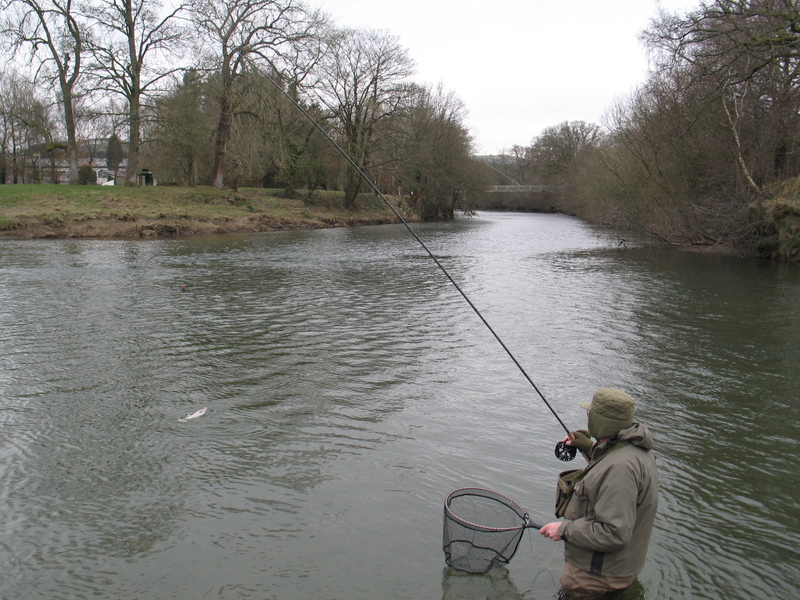 Then there was the constant snags on the bottom to contend with, resulting in numerous lost hooklengths. Oh and the bankside jungle snagged me at every opportunity. If I sound like I’ve got grumpy old man syndrome or a touch of whingeitis, well yes I have. Thank God there was no one around to hear my curses. Ah well, except for that chap that was just about to move into the swim just above me. He didn’t see me ensconced in amongst the trees. When I burst into a frenzied maelstrom of obscene profanities he beat a hasty retreat that’s for sure, scuttling back from whence he came. He may well of thought it was aimed at him. No, it was to Mother Nature for all of the things she sent my way just to cause me grief. Anyways, I continued upstream loosing bits and pieces as I went. As the light faded I managed to tempt a few final suicidal roach and gudgeon. Big ones too. The gudgeon that is. So I ended the day with a nice dozen lovely roach. Nothing big but wonderful to catch river roach and on the stick and pin. Geoff had some lovely fish too however he could only muster 11, so came a poor second. Well something had to make my day, after all of the disasters I’d had. We have both enjoyed our time here. We’ve caught some really superb fish. Not monsters but tremendous sport. I’m certain we’ll be back next winter. Until then dear roach; adiós muchachos . 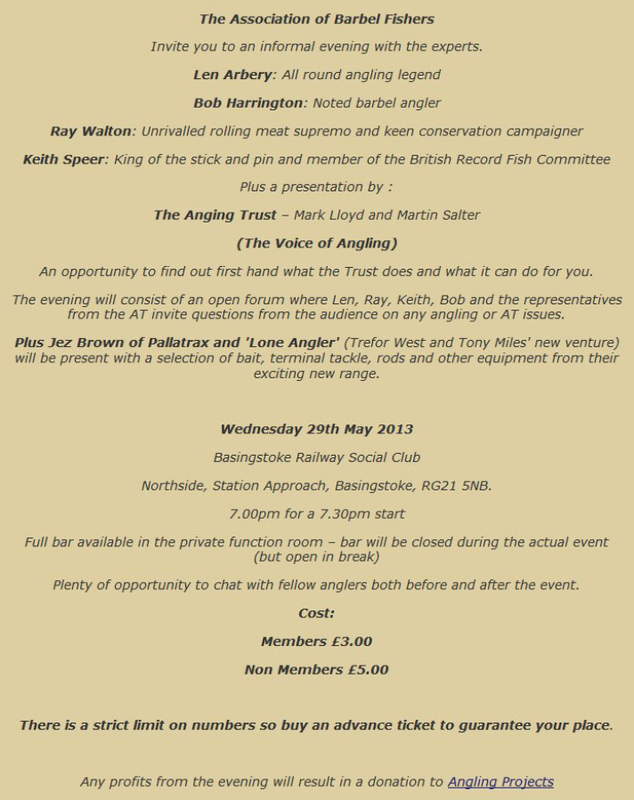 I am delighted to announce the next instalment of the The Association of Barbel Fishers ~ Meet The Experts Evening events. 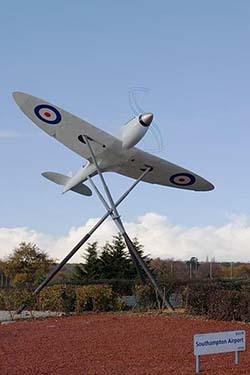 It will be taking place at Basingstoke on the 29th May. We have an incredible line up: Len Arbery, Bob Harrington, Ray Walton and Keith Speer. 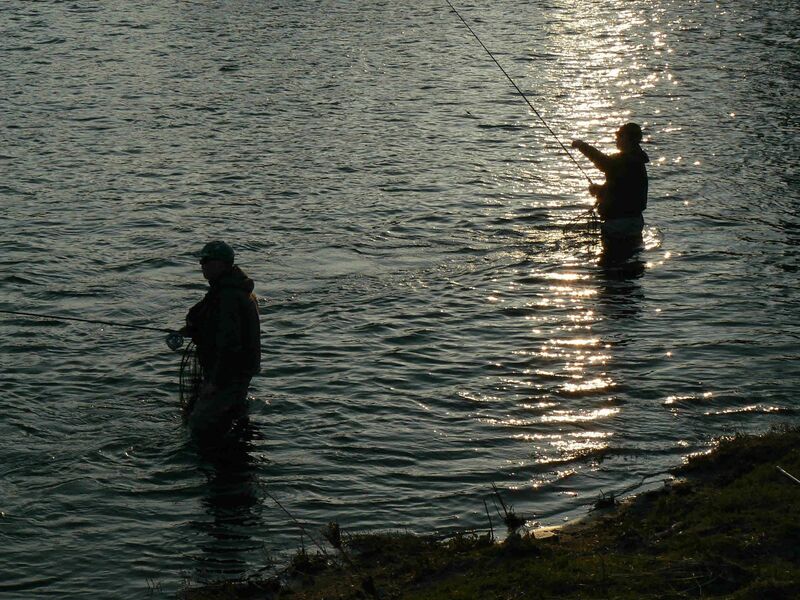 Martin Salter and Mark Lloyd will be giving a presentation on the Angling Trust and then joining the rest of the panellists to take questions from the audience. Last years event was a tremendous success and we are certain that this event will be equally enjoyable, informative and entertaining. 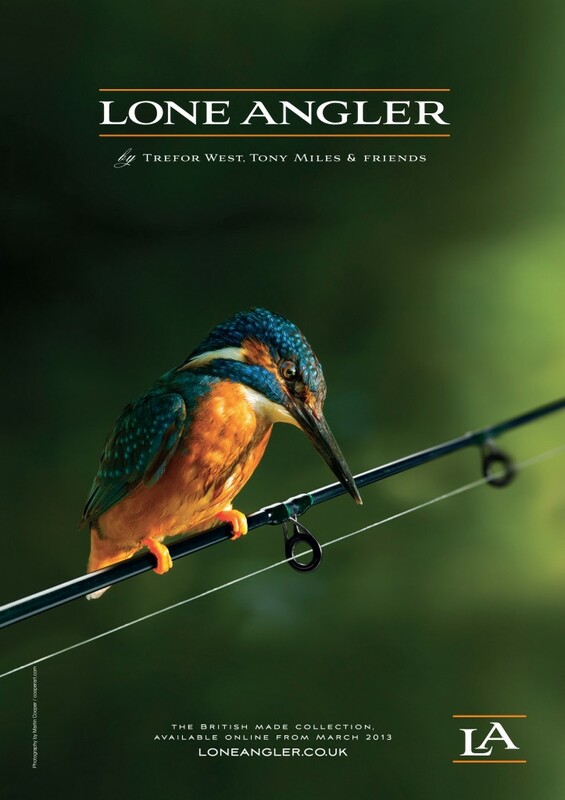 Also on hand will be the guys from Pallatrax with a great selection of their products and they will also be showcasing the exciting new ‘Lone Angler’ range, with products designed and tested by Trefor West and Tony Miles. Tickets are just £3 for members and £5 for non members. Non members will have the opportunity to sign up on the night. Doors open at 6.30pm and the event will start from 7.30pm. There is a bar available, so please come and join us for what should be a great evening. All profits from the evening will be donated to Angling Projects. If you are an ABF member, make sure you are logged on prior to buying a ticket. 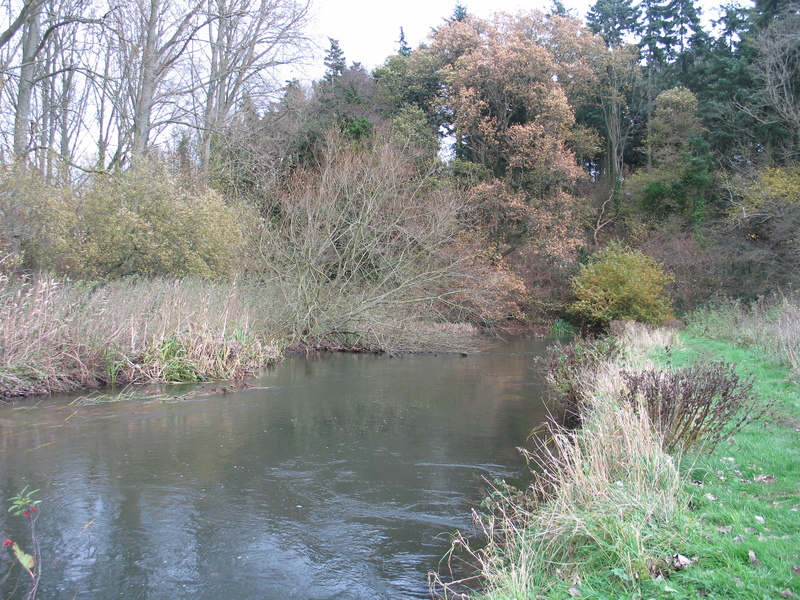 I have recently visited the Lower Itchen Fishery on two occasions but only for the roach fishing. At one time you couldn’t have prized me away from the big grayling that used to be commonplace here but sadly those days seem to have gone and the desire to catch decent roach has taken over. 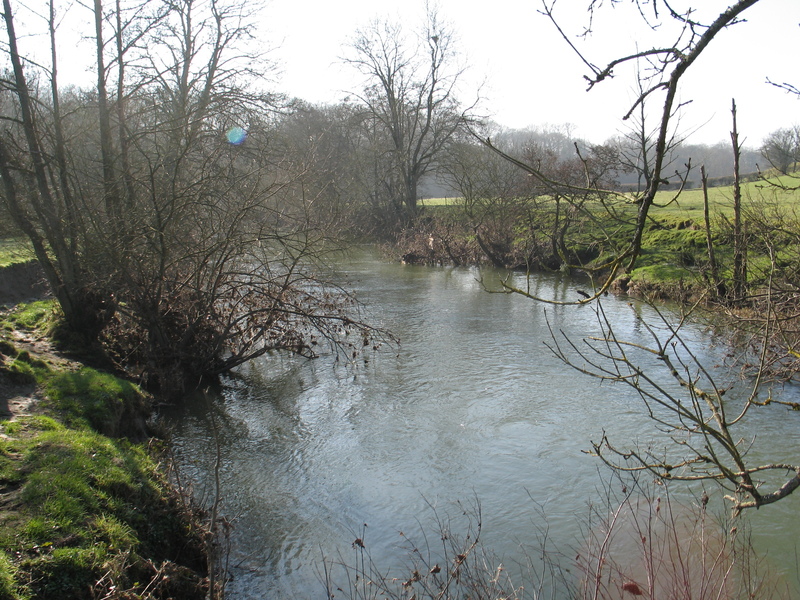 The Itchen has become quite famous for the quality of the specimen roach that it produces. It regularly throws up good 2s and there seems to be plenty of fish over the 1lb mark to be had. As always, a well run fishery with a good river keeper, seems to be the key. 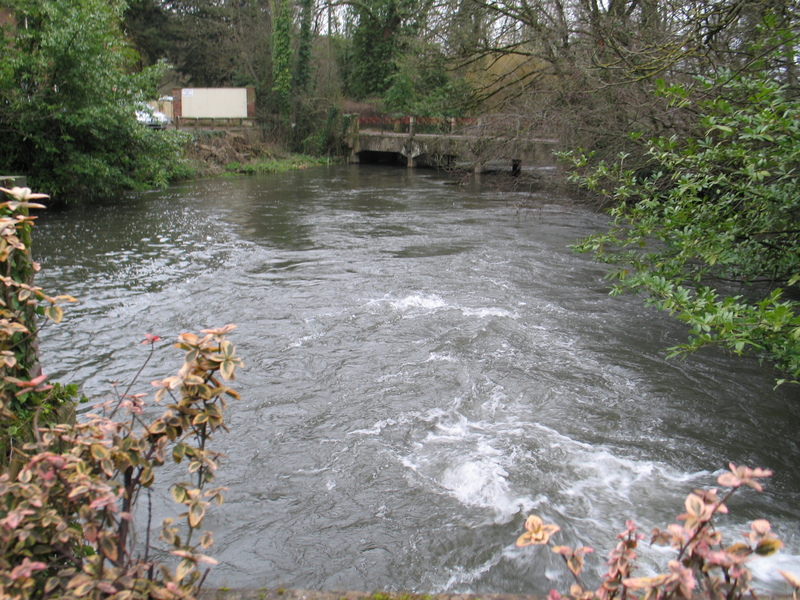 They manage the river in all of its seasonal moods very well and this encourages quality fish reproduction and a very healthy environment for them to grow big. 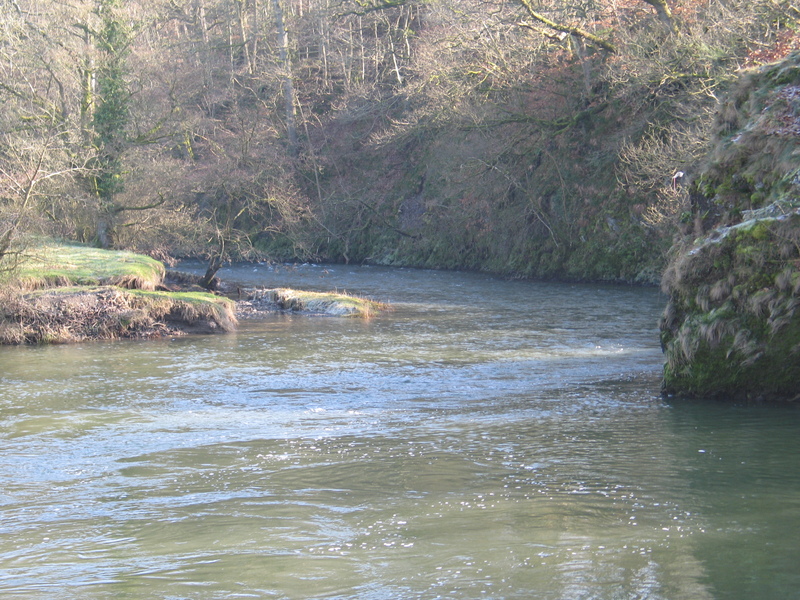 On our first visit here, which was just after our Welsh trip, I was advised by Jez Brown to target an area just below the main mill. It did look ideal with water gushing into a pool having passed under the old Mill itself. It created a lovely big crease and I have to say, screamed roach. So I decided to just sit it out here all day and feeder fish maggots. The trip was on behalf of the Barbel Angler website and owner Micky Holtom was one of the guys down to fish. We met as usual at the Winchester services where for the price of a small Principality you can buy a mediocre breakfast. I declined the offer to eat and opted for a coffee instead. All in all there would be about 20-25 of us. So as I said I set-up a feeder rod and fished a medium sized Kamasan Black Cap to a 16 hook and double red maggot. Casting out regularly to build up the swim, I kept bait going in continuously throughout the day. 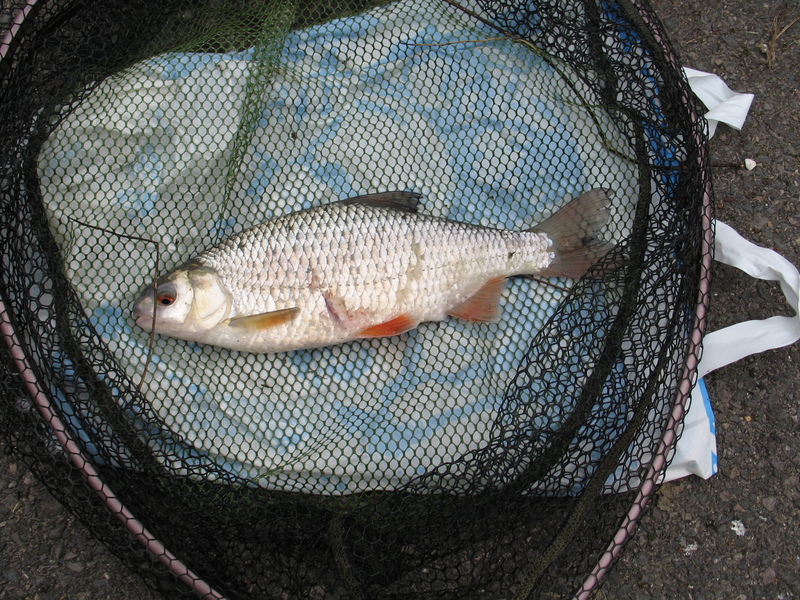 However the first cast produced the biggest roach of the day for me at 1lb 4oz. I followed that up with about 20 more roach to just under a pound but later in the day a pike moved in and I think spooked the roach. All I could get after that was very sharp bites that were unhittable. As well as the roach I had quite a mixed bag really. 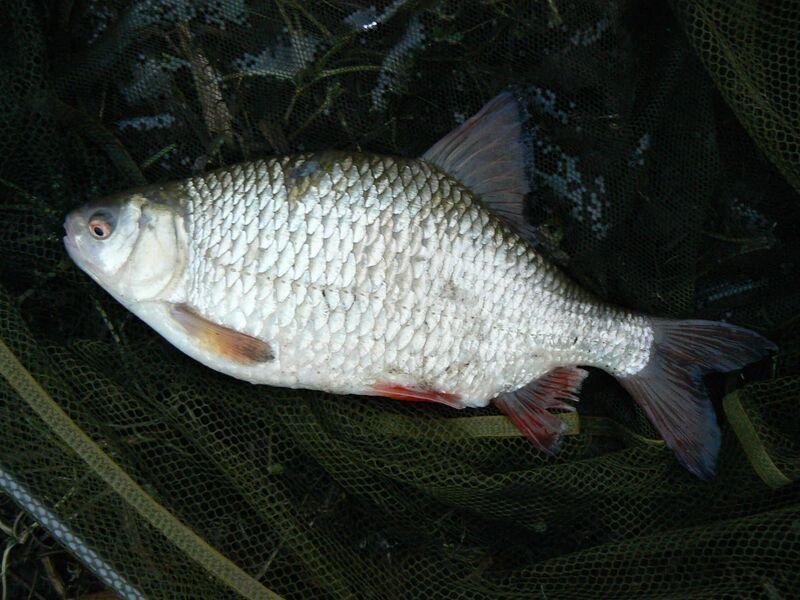 Small chub, dace, gudgeon and about 6 or 7 Bream to 4lb 12oz came my way, so I had a lovely day’s mixed sport. It kept me busy all day and and I rarely had any period of no action of some sort. Perhaps I should have moved once that pike turned up and despite the Pallatrax boys (JeZ Brown and Luke Ayling) trying to coax the pike out on a dead bait, the swim was never quite the same. We all met back at the car park and it seemed some had done reasonably well. Jez and the other boys had taken grayling to a fraction under 2lbs, with numerous other rods taking some nice fish to around that mark too. Keith Speer stuck it out in his swim, despite the slow going, and was eventually rewarded with a lovely roach of 2lb 8oz. Geoff fished a spot that I particularly like at the lower end of the fishery and managed a number of nice roach to 1lb 11oz but sadly lost a couple of better fish. Around 8 of us retired to the White Swan public house for one of their excellent carveries before the journey home. It was another great day in great company and lets hope there are many more to come. Thanks lads. On the second recent visit I again set out my stall for the roach. I targeted the area Geoff had fished the week previously and my intention was stay there pretty much all day. Both Kevin and Geoff opted for the top end of the fishery hoping for a decent grayling. The river appeared to be really pushing through with a touch of colour. The flow was perhaps a bit more than we would have liked but we had to make the most of what we had. It seemed to be a busy day. There were quite a few booked into the LIF stretch and lots of guys on the fee stretch. None of this affected me as the spot I wanted to fish is awkward to access from the other bank so I had this spot to myself. The usual tactics were employed: Avon float, bulk shot, 3lb mainline. I started with breadflake to a 10 hook and on one of the first casts I landed a lovely 15oz roach shortly followed by another. I then lost a fish and the swim seemed to die. I took a break and poured myself a cup of steaming hot coffee and watched the planes appear over the treeline as they made their decent into the airfield nearby. The roar of the jets engines rang in my ears but I’m so used to it I find it, in a perverse way, an enjoyable distraction from the fishing. 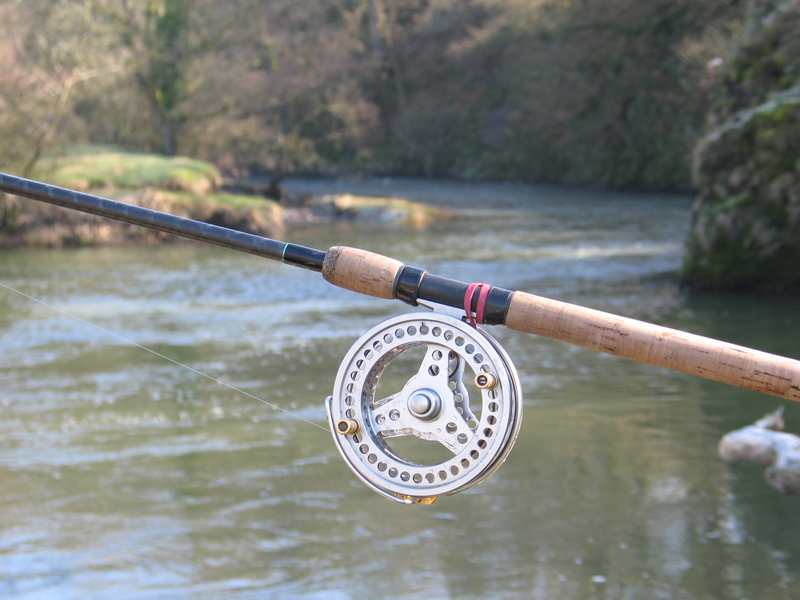 I phoned Geoff and it seemed the fishing was quite frustrating upstream. The flow was making things difficult and Geoff had either bumped off or lost quite a few good grayling. Between him and Kevin they did end up with a few though to about 1lb 13oz I think, but it was rather slow going. Keith Speer wandered down for a chat late morning/lunchtime and we chewed the fat over coffee for a while when we were joined by one of Keith’s fishing pals. 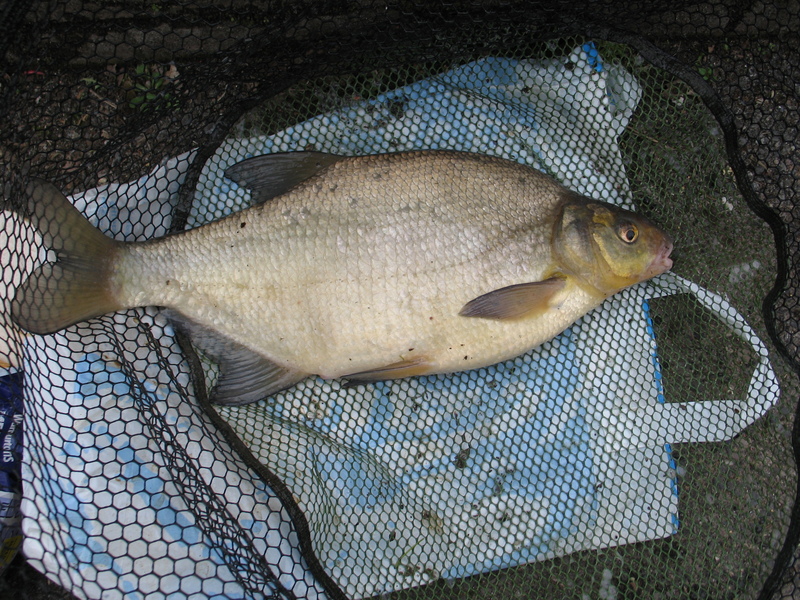 He had already caught a couple of nice roach going 1lb 14oz and 2lb 1oz, so the big girls were feeding. Keith had only managed to find the chub but had already taken around 8 or 9 nice fish. Later on Keith’s mate had a further 2 good roach of 2lb and 2lb 8oz, so what a tremendous result that was and I think Keith ended up with about 15 chub. I carried on fishing and swapping baits from maggots to bread. The maggots certainly produced more bites and I had several fish around the 1lb mark. As the light faded I hoped that some of the bigger fish would put in an appearance but sadly they failed to show. Geoff struggled for bites once he moved down into this area mid to late afternoon but Kevin got amongst the chub below the road bridge and ended up with 11 and a couple of small roach. So all in all another pleasant day on the river and with just a short time to go before the end of the season, here’s hoping for a successful final fling to one and all. Another Richard and Jane full Welsh breakfast saw us fully sated and ready for action, well a snooze really. We didn’t have time for further rest and so it was to the banks of the Wye to see if we could tempt a few final grayling between now and our last few hours on the bank the following day. There was a bitterly cold wind blowing upstream and within 10 or 15 minutes of being in the water the cold seemed to seep in to our very bones. I had to get out every so often and do a highland jig on the banks in an effort to generate some heat into the partially frozen flesh. Despite the numerous loose layers of clothing that one needs at this time of the year, a strong wind seems to make a mockery out the theory of warm and windproof! Dan fished a swim that we know produces well. 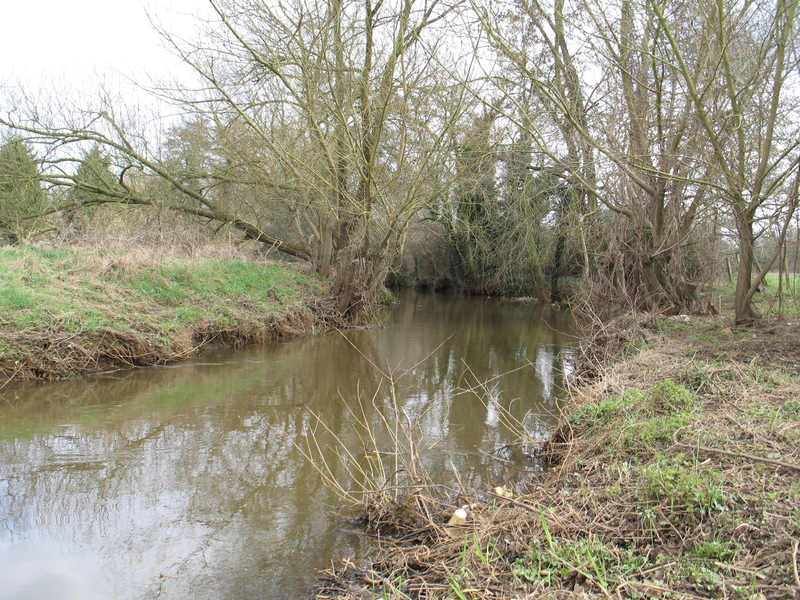 There is a crease that runs from almost the near bank diagonally across the river to about mid way, where a feeder stream enters the river from the opposite bank. 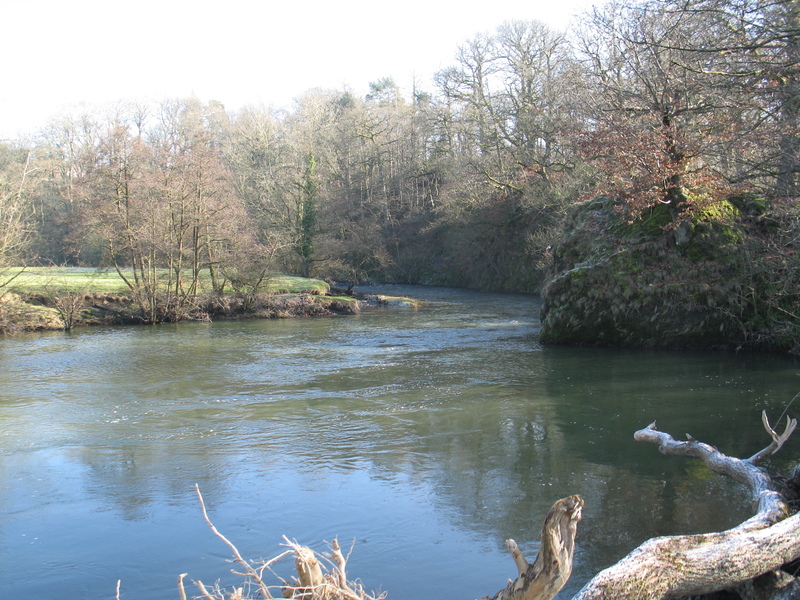 Its reasonably deep and seems to hold large numbers of fish during the late winter months. Its an easy spot to fish, just drop the float in and ease it along the crease. After a short period of feeding, the fish can be pulled in quite close, almost taking the bait from under your feet. Fish can be caught at pretty much any distance along the long line of the crease and of varying sizes. 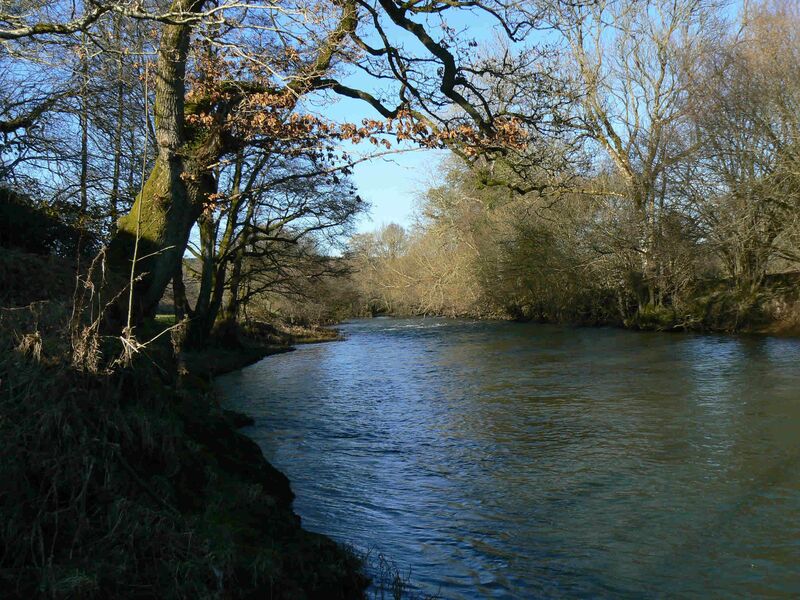 This area has produced the odd 2lb fish but generally most of the fish are a pound plus and plenty in the 1lb 8oz – 1lb 12oz range. It didn’t take long for Dan to get into a nice grayling and he continued to catch up until lunchtime. 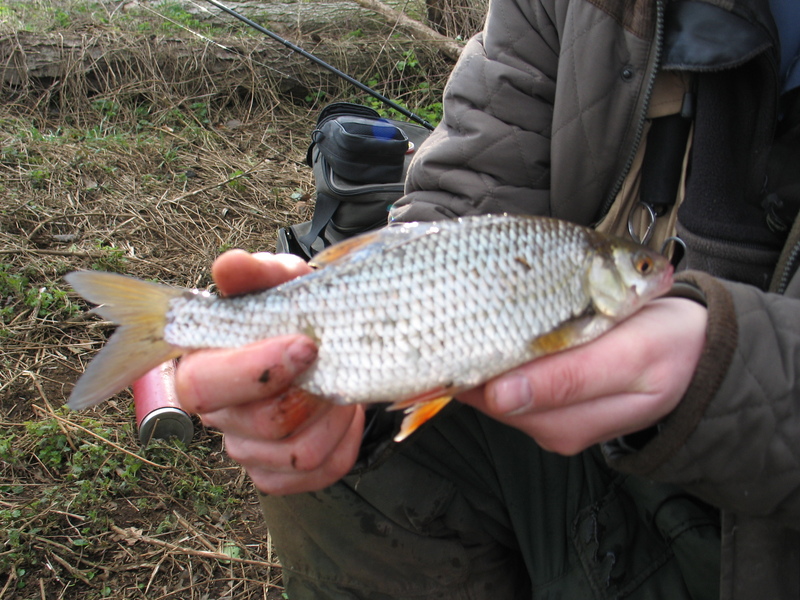 He fed with a small bait dropper and this kept the grayling quite close to his bank. I fished 30 yards above him and trotted down quite close to the bank, where there was a visible drop off in the gravel bottom. I kept a small amount of feed going in every cast and soon I too started to catch. I had several nice grayling and then sadly lost a very big fish which I could not move. I waded downstream and kept the fish under pressure. Still it refused to budge and the rod was almost creaking at the strain and the line sung in the wind. Eventually the fish boiled on the surface and I caught a glimpse of a big dorsal, then the fish plunged down and the hook popped out! I may have said “damn” or something at this point. If it was a grayling (and I was certain it was) it was a very big fish. A cup of coffee always helps to relieve the pain and it at least gave me the opportunity to warm up. 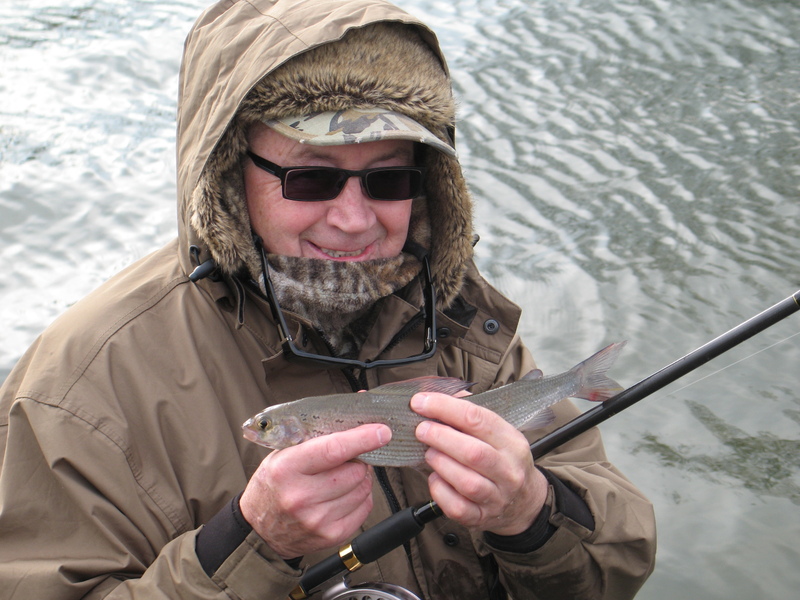 By now I’d had grayling to 1lb 14oz and was much happier than I was over the first three days of our trip. Dan and I swapped places and I think Dan had caught about 10-12 fish. I jumped in and caught on and off for the remainder of the afternoon. Just feeding pretty much every cast kept the swim alive, however the area was fishing much slower than in previous visits. Despite this I caught some nice grayling and a few trout. I think I ended the day with 22 or 23 to just under 2lbs. Dan finished a little behind me on maybe 16 or 17, so for us two it had been a turnaround of fortunes at long last. Kevin and Geoff had fished the opposite bank both down by the town bridge and then further upstream and almost opposite Dan and I. 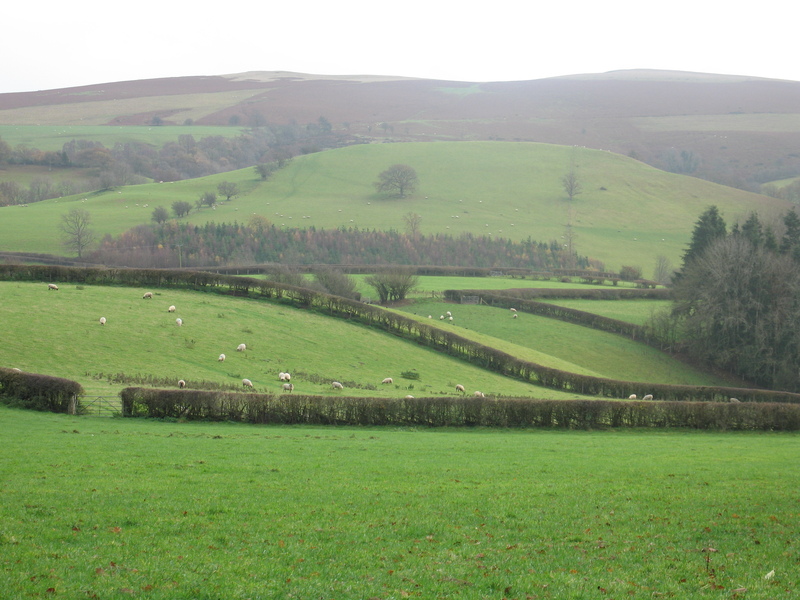 They also had a brief visit to another section of the Irfon but with very little to show for their efforts. I think they ended up with a couple of grayling each. It was our last night at the cottage so we decided to head out for a meal and a pint. We would have to be up fairly early to pack the car prior to going fishing for a few hours and then heading home mid afternoon. So after saying farewell to our wonderful hosts, we headed back to the town stretch of the Wye. We felt it fair to rotate the main productive areas and then try a few odd swims further upstream. The exploration of one swim proved most rewarding and enlightening. All four of us caught a few fish but the fishing was very slow. It was just an odd fish here and there and the cold was almost crippling. Dan fished a lovely swim some way upstream and managed to catch several nice grayling when it was his turn to have a go in the ‘banker’ swim. I had pretty much had enough and so wandered up to see Kevin who was now fishing Dan’s first swim. It was a perfect looking spot. The river straightened after a bend and then the shallow water dropped into a deep run, where a crease created a lovely smooth glide. After a couple of test runs with the float, Kevin made a few adjustments and the float was gently wafting downstream when it disappeared. Kevin stuck into a very nice fish. 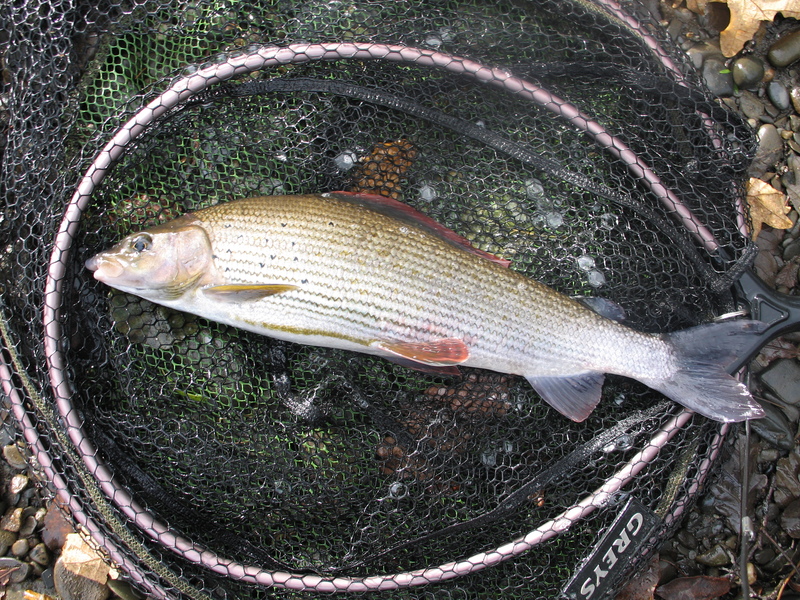 It fought well and evaded capture for a while before I finally slipped the net under a fine grayling. It had big thick set shoulders and a lovely bright dorsal fin. It looked about 2 1/4lbs and my estimate wasn’t far off, it weighed 2lb 3oz. There was a small v shaped scar just below its dorsal fin where a cormorant or some other predator had grabbed it at some point and a single scar on the other side. Kevin was over the moon and we photographed the fish and put her back. After sorting his camera out and re-baiting the hook, Kevin dropped the float in to the same spot again. His reel tangled whilst his float sat almost motionless in the swim. The float then seemed to drag under and I informed Kevin that his float had been pulled under. He lifted the rod tip to dislodge the float from what appeared to be the riverbed, when he found another good grayling attached to the hook! Incredibly, despite the lack of a strike, the fish stayed on. It fought for a while but soon gave up and I could see it was another ‘2’. As the fish slipped into the waiting landing net I saw a familiar scar! Er it was the same fish again. The scar matched and so did the weight. Well who would have believed it, the same fish in two casts. That was nothing believe me. We returned the fish slightly upstream and again Kevin sorted his float and bait out and after a few minutes in went the baited rig again. Once again the float appeared to snag bottom and just slowly sank out of sight. Kevin flicked the rod tip and a heavy weight was felt on the end. For a while he thought he had caught the bottom when up popped another good grayling. How bizarre but surely this couldn’t be the same fish? Well it was. Three casts and the same fish three times. Kevin decided to have a cup of tea and we couldn’t quite believe what had just happened. Perhaps this is more common than we realise. Luckily this fish was easily identifiable so we knew it was a recapture, with other grayling it would be far more difficult to tell. I had a go in the swim whilst Kevin watched. The float gently drifted downstream when it appeared to snag bottom. I stuck and felt what seemed like a dead weight on the other end. Of course we both knew what it was and we weren’t wrong. 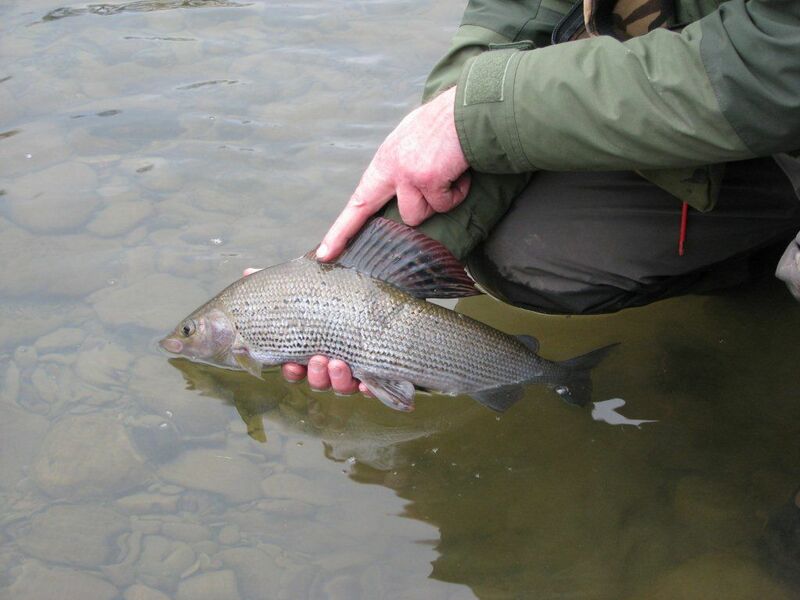 It was the same grayling yet again. Four casts and four times it appeared. This seemed remarkable. 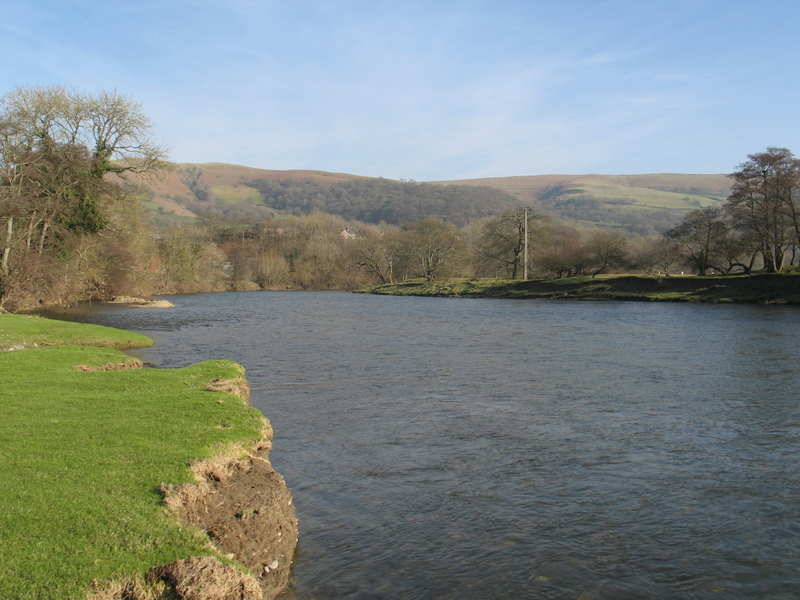 The fish was returned again and as with the previous 3 occasions rested for a short while before gliding off silently into the bright waters of the Wye. Well it was certainly a talking point. By now Geoff was bored so he too wandered up. We told him what had happened and he could hardly believe it. Both Kevin and I certainly didn’t want to fish the swim again, just in case. It seemed unfair on the fish so we left. Never in a million years did we think that fish would be caught again, that was impossible. Geoff fished the swim for a while and Kevin watched. After sometime nothing had happened and it seemed that perhaps that had been the only fish in the swim. Geoff continued and after may 15-20 minutes the float appeared to snag bottom. Geoff of course lifted the rod and felt a dead weight. “Bugger, caught on the bottom” exclaims Geoff. “Oh no” says Kevin, “That’s the grayling” and indeed it was. Again the fish rested, as all big grayling do, and then slowly swam back into the waters and no doubt back to its favourite spot. Still we wouldn’t find out because that was enough for us. We decided to call it a day and head home. Dan finished top rod with 7 or 8 grayling to upper 1s and our friend was like the proverbial bus, you weight for ages and several turn up at once, well five times in this case. Anyway I hope our friend moves on and has a peaceful retirement. So our Welsh odyssey finished on a rather unusual note and we all look forward to our return here next winter. 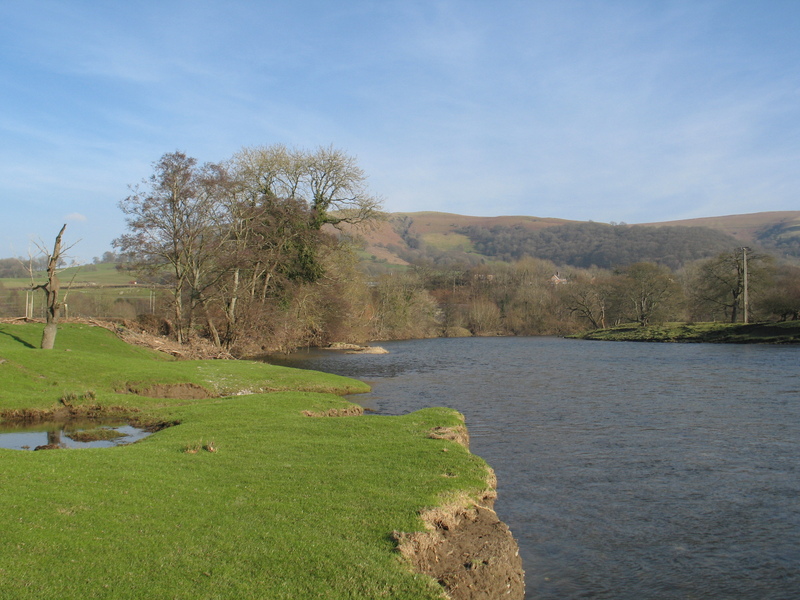 On days two and three of this trip we had access to a private stretch of the Irfon and had arranged for access on to another Wye tributary, the Ithon. First up was the Ithon and you couldn’t imagine a wilder or more isolated river if you tried. It looked for all intents and purposes completely unfished and untrodden by man. It was more of a lowland river than the likes of the upper Wye or Irfon and as such cut through thick woods where access was, well, tricky. The banks were heavily tree-lined and thick foliage choked the banks. The margins appeared quite deep in most places and also thick silt meant that an unwary boot could quite easily disappear down to the knee. However despite this there were plenty of areas where gravel was quite apparent and with some lovely shallow gravel runs and riffles plus a few long glides, things looked pretty good. We thought we had found paradise to be honest. As the river cut through the surrounding countryside, we marvelled at the unkempt look and a feeling of a true wilderness. We were soon to realise we were not the only ones who thought this was untouched by man. After fishing for a couple of hours and not a single bite between 4 of us we started to wonder what was wrong. Then Kevin spotted 5 otters swimming together and almost immediately I spotted two more as they fizzed through my swim and then surfaced like nuclear submarines just downstream of me. It is always a delight to see nature raw and in the flesh and that’s one of the great joys of angling. You see so much incredible wildlife up close and personal. However otters in this quantity on such a small river seems too much and almost unnatural. I always thought otters had quite a big territory but obviously not. Despite exploring most of the length of this 4 mile stretch we never had a single bite. Still I thoroughly enjoyed the walk and the views. At one point the land climbed sharply upwards and the track led me to a heavily wooded section. I climbed over the fence and followed the path through the thick pine forest. As I entered the dark gloom of the trees I could almost sense the darkness enveloping me, such was its aphotic nature. I was by now about 50 feet above the river on a very narrow path that had a sheer drop to the rapids below. It was a scene reminiscent of something out of the movie Deliverance. I just didn’t want to have to squeal like a pig! The view was simply stunning and if the track hadn’t been so narrow I would have taken a few shots with the camera, however a fear of heights prevented me from even contemplating that. So yet again we returned to the cottage a tad disappointed and a little despondent. We just hoped that the following day would prove better. So we headed off the following morning to a private stretch of the Irfon. It was in an area we had fished before however from the opposite bank and this beat ran further upstream by some distance to an area unexplored by any of us. Once again the river looked spot on. 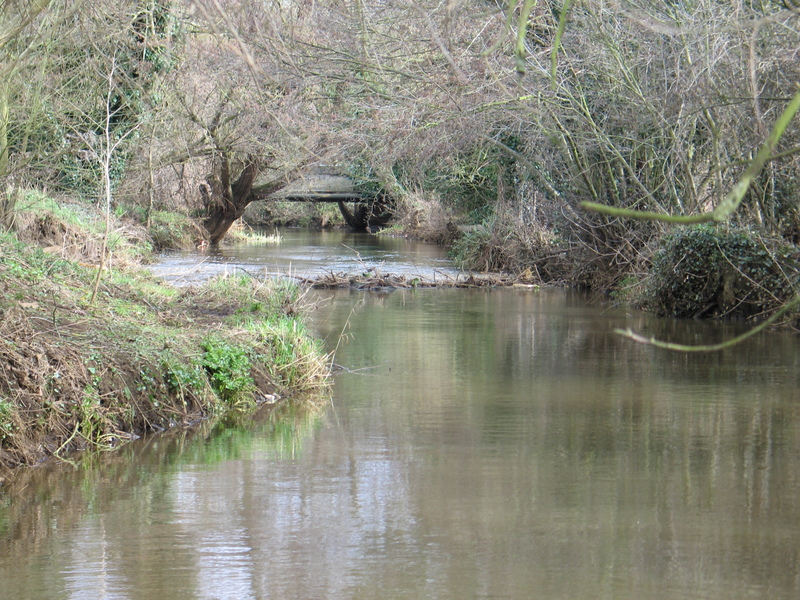 This part of the river runs through heavily treelined countryside and you get the feeling it is largely unfished and even uninhabited. You really do feel like your the first person to walk these banks in years, which makes it all rather special. 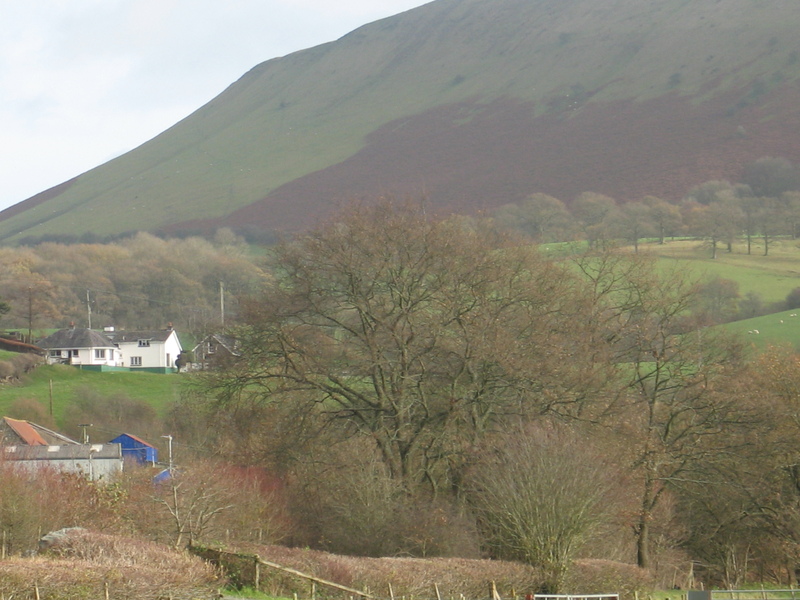 As with much of the Irfon its a mixture of gravel and bedrock. The bedrock is very awkward to wade on in places and the right foot wear is imperative. Once again lots of gravel runs, pools, riffles and glides to choose from and once again the same result as yesterday; not a single bite between us. I fished numerous gorgeous looking swims and just couldn’t muster a bite. It may be a coincidence but we found lots of otter tracks and even the partial remains of half eaten fish. However as I have said before February can be a bit tricky, so this may be why we were struggling so much. Nevertheless it was a stunning section and gave us the opportunity to explore even more of the glorious Welsh countryside. Wildlife abounds of course and we saw Kites and Buzzards plus dippers which hurtle along the river’s course just above the water at breakneck speed, very much like the Kingfisher. So far I have not seen any deer in Wales which really surprises me as it looks ideal due to the remoteness of many of these venues. The only thing missing were the grayling! 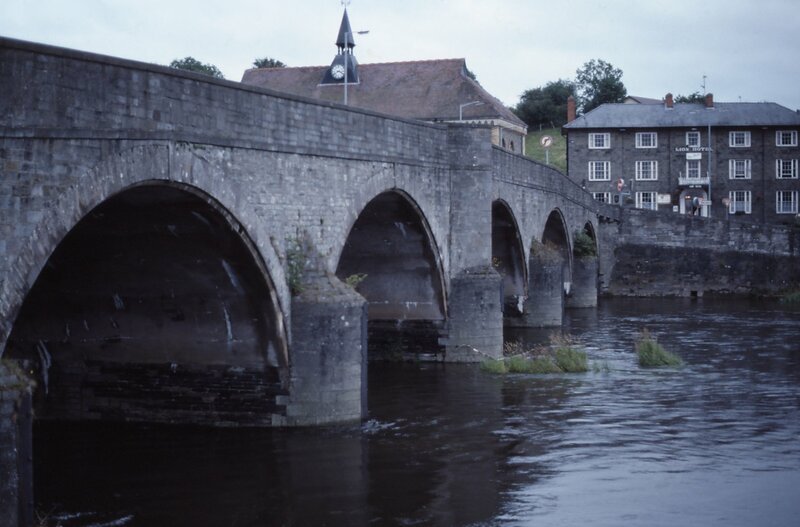 Later on in the afternoon we took the decision to move onto the Wye and fish the town section. We have found this can fish well during February and it seems this is one of the areas that the fish like to shoal up. So we hedged our bets and made a move. It turned out to be the right decision too. Dan and I fished one side, whilst Geoff and Kevin opted for an area that had produced large numbers of grayling for us previously. I fished down towards the town bridge and soon had a fish attached. It was a miracle! It turned out to be a nice grayling and I decided to move downstream and wade out a bit. The river was a little shallower here and I fished in about 2’6″ of water. Soon the float buried again and a nice grayling turned against the flow and fought like a tiger. Eventually I landed it and weighed her in at 1lb 10oz. Another of a similar size followed and I bumped a few off. Dan was still biteless and by now the temperature had dropped even more and there was a raw easterly wind coming straight at us from the opposite bank, which cut straight through us. We had just about had enough. Both Dan and I decided to contact Geoff and say lets call it a day. 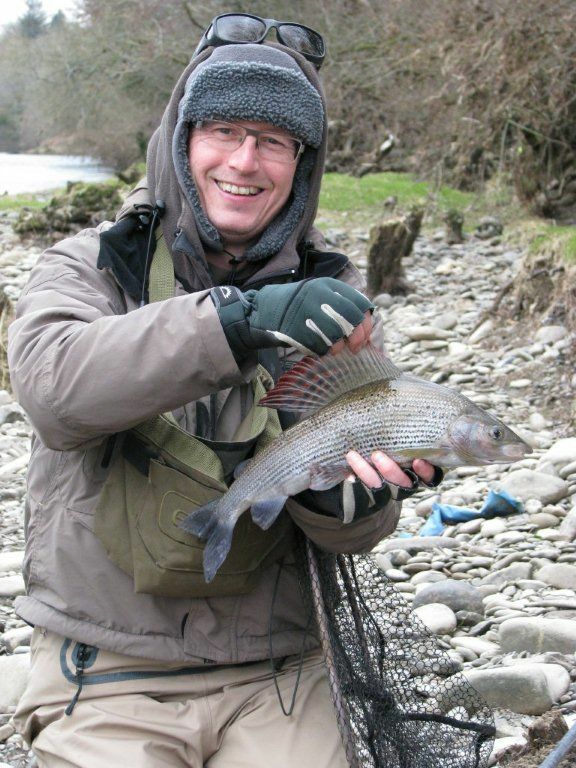 However both Geoff and Kevin were catching from the regular spot and both ended up with 17 or 18 grayling to upper 1s. However they too were pretty chilly and so enough was enough and once again we headed back to the warm and comforting security of the cottage. Dinner beckoned. At last we were heading back to the beautiful valleys of Wales. 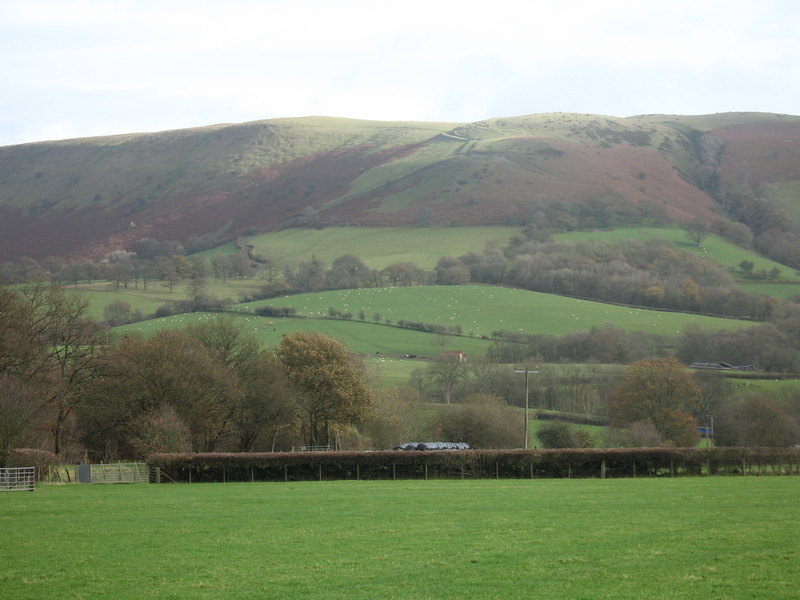 We love this area of Mid Wales. The scenery is breathtaking, the people are very friendly and helpful and the fishing can be amazing. As you are aware the weather in the run up to Mid February was looking a bit iffy, to say the least. We had heavy rain followed by a couple of spells of fairly substantial snow fall and then rain again. The end result was a lot of snow melt and more flooded rivers. We were beginning to get a little worried that our planned trip could well be a disaster. Luckily the fishing Gods smiled down on us and the conditions stabilised about a week prior to our departure. We kept a close eye on the forecast (which was looking pretty good the closer the trip came) and the river levels seemed to be improving all of the time. It seemed this time around we were at last due a good week. The usual array of tackle was loaded into the car, trailer and roof box. The more space we seem to have the more we fill it up with additional gear. We never quite seem to have enough room. Still we were on our way. The M25 and M4 were as delightful as ever, at times they appear to be Europe’s finest car parks! We had our traditional stop at Membury Services for a hearty breakfast. So after re-mortgaging the house and a double dose of indigestion tablets to try and keep it all down, we began the final leg to Powys. It was slow going unfortunately and after being on the road for about 6 hours, we eventually arrived at our destination! We were keen to get down to the river. We had our fingers crossed that the river would be in good sorts and I’m pleased to say we were not disappointed. 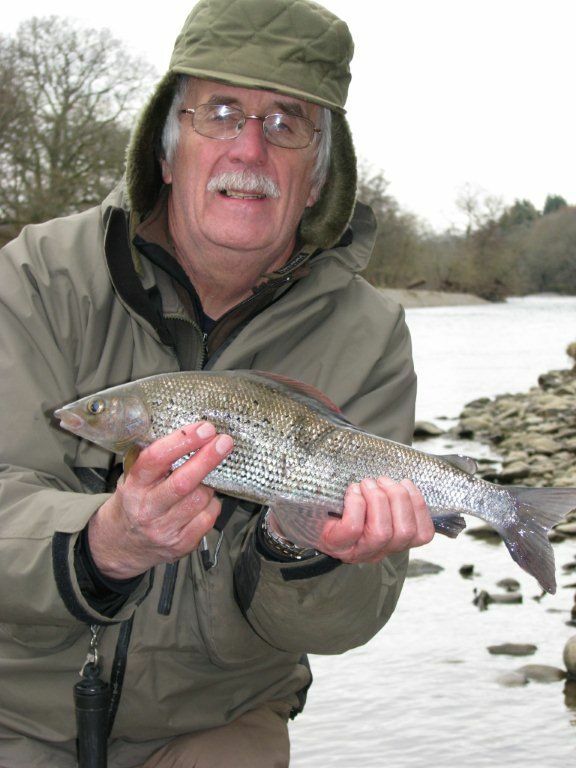 The Wye was at a good level, probably slightly up and a good colour for grayling fishing. As we walked down to the river the low clouds shrouded the surrounding hills in mist and we could have almost been in the Himalayas. The place takes on an almost mystical look when the conditions are like this and I was secretly hoping that the Dalai Lama might turn up and bless me with a mythical ability to catch a prodigious amount of very large grayling. Sadly he didn’t show up and neither did the very large grayling. I’ve probably mentioned this before, but February can be a bit tricky for grayling. 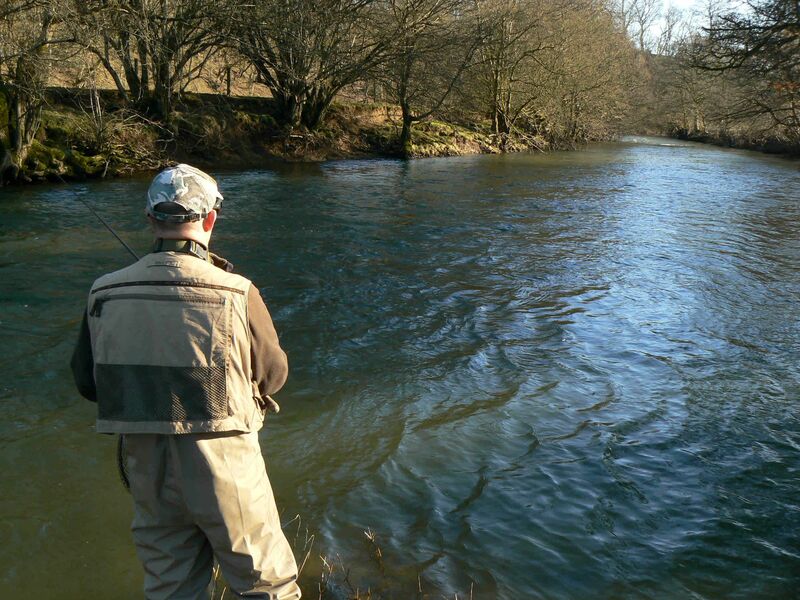 From around mid to late Feb they start to shoal up, so you have to find the shoals to get a decent catch of fish. On this first day all of the regular haunts seemed devoid of grayling, despite the fact that normally we can catch large numbers of fish from these spots with great consistency. My efforts were proving rather poor and I had this horrible feeling that the other three were probably bagging up. After a quick check with them, I found that we were all struggling with barely a bite, let alone a fish caught. In situations like this you have to explore each area bit by bit and use the float as a exploratory tool (Oh er missus) to see if you can locate some fish. You need to fish different lines in the swim and control the speed of the float to allow a slightly varied presentation of the bait to try and gauge where the fish are and how they want the bait presented. As any float angler knows that by using different weight floats and altering your set-up slightly (bulking of shot higher or lower, stringing shot out, or altering the proximity of the dropper shots to the hook) you can very greatly the passage of the float and more importantly the baits progress downstream. Sometimes holding back really hard and just allowing it to almost inch through the swim can be the only way to get a bite, whilst at other times they seem to like a fairly regular speed to take the bait. Keep playing until you get results. As the afternoon wore on the sun poked its head out and the surrounding hills were lit up in spectacular fashion by the sun’s rays. It was still freezing though but the clear blue skies and sunshine certainly helps to cheer you up after such a long spell of dreary, grey conditions. I kept wandering and altering my approach and eventually hooked a fish, which promptly came off. I saw the fish and it was a grayling, so at last I had at least found some fish and induced a bite. I continued in this spot for some time and caught a couple of average sized grayling and a nice chub of about 3lbs or so. Sadly though that was it. It had proved to be a tough opening day with Dan biteless and Geoff graylingless. Not the best start we’ve had and yet conditions looked ideal. Well keep a welcome in the hillside.